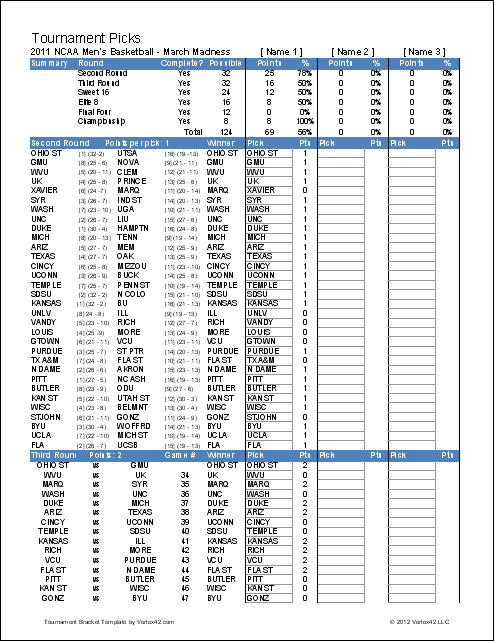 Download our free 2019 March Madness Bracket Template to print blank brackets and track players' picks for your office pool or friendly competition. You'll also find single elimination and double elimination bracket templates for other tournaments you may be organizing or participating in. Continue reading to learn more about the features in each of these free tournament bracket templates, and find some helpful resources to help you organize tournaments. NOTE: We have updated the template with the 2019 starting seeds. Enjoy! Use this 2019 NCAA College Basketball bracket to track the March Madness tournament on your own, or use the pool worksheet to help you run the best office pool in town. Enter the final scores for each game and the tournament bracket will automatically update until a champion is crowned. The office pool feature will automatically calculate points for each game and show who is currently leading. You can choose to have each player define all the picks at the start of the competition, or enter new picks after each round. You can also set up your own point system - awarding a different number of points for making correct picks in each round. The worksheet contains double-elimination brackets for tournaments that include anywhere from 3 to 16 teams as well as 20, 24, 30 and 32 teams. Each bracket includes the option to use tournament seeds or a random start. You can also hide or display the recommended game order to balance the playing load of any one team. 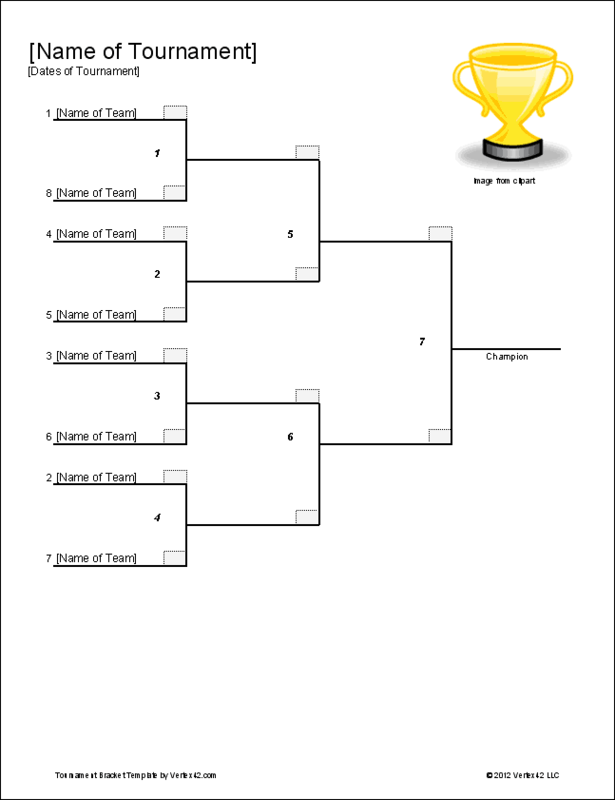 This printable single-elimination bracket template includes a number of different sheets to support a wide number of teams, including any number between 3 and 16 as well as 20, 24, 30 and 32 teams. Each tournament bracket has the option to use tournament seeds and to display or hide game numbers. After we upload the new bracket with the 2019 information, the bracket will be ready to go. Just enjoy the games and enter the final scores to keep the bracket updated. Enter picks into the pool worksheet. Use the game numbers on the bracket and the table to line up the proper games. Keep the bracket updated with scores and the pool will be updated too. 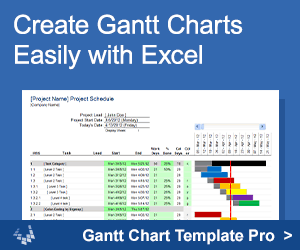 Consider placing the spreadsheet where everyone can see the current leaders. Sit back and enjoy the tournament, and pray that your underdogs really do win. If you aren't sure how many teams you are going to have in your tournament, print out multiple brackets or print out a bracket that will handle them all. Use BYEs to fill in empty starting positions if teams fail to show up or the bracket is slightly larger than needed. 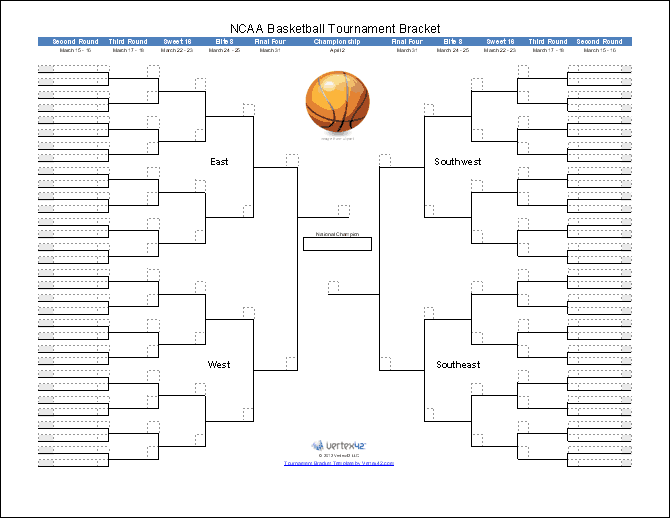 Print the bracket on a large plotter (most copy centers will have one) if you want to post it for everyone to see. Or, use a projector and a laptop to display the bracket on a wall so that everyone can see how the tournament is progressing. Make sure you have ample time to complete your tournament, especially if court or field space is limited. A single drawn-out game can mess up an entire tournament schedule. Make sure you include enough time in between games to allow for the longer games. 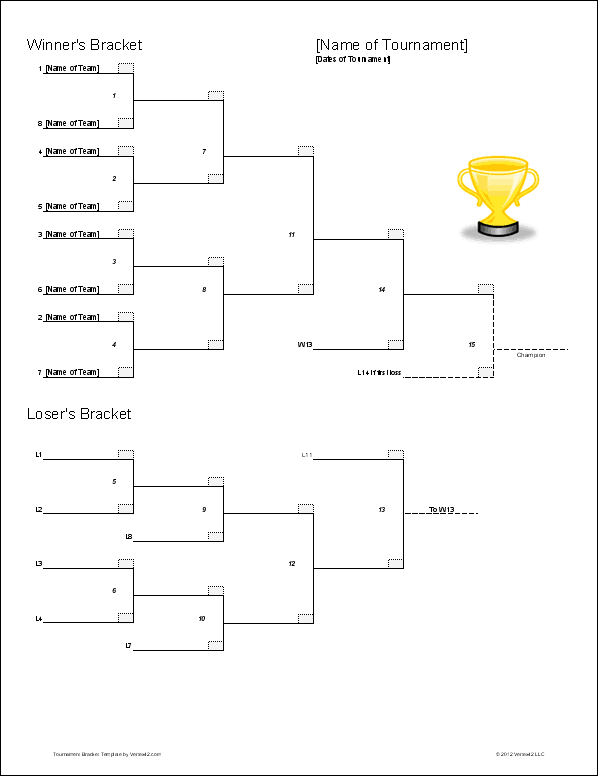 Printable Tournament Brackets at printyourbrackets.com - Handy place to go print a quick bracket for nearly any sport and tournament type. Printable 2019 March Madness Bracket at ncaa.com - A blank PDF with teams listed. 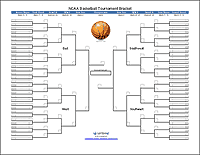 Official 2019 NCAA Tournament Bracket at ncaa.com - A place to get the latest information on the NCAA March Madness Tournament and print an updated bracket. Official NCAA March Madness Page at ncaa.com - 2019 March Madness schedule and information about viewing the games live.